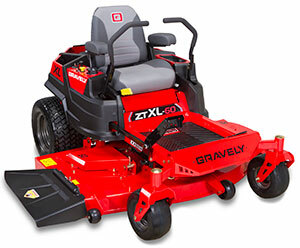 Gravely expanded its Pro-Turn series with the addition of the 72-inch X-Factor II deck and a 60-inch deck option for the Gravely ZT XL prosumer line of zero-turn mowers. The new X-Factor II 72-inch deck is available on the Gravely Pro-Turn 200 and 400 series of commercial zero-turn mowers. According to the company, the improved front deck wall profile, in addition to a larger adjustable blowout baffle, reduces the amount of blowout and aids in suction. Powered by a 24-hp Kawasaki FR engine, the ZT XL 60 features 20-inch by 12-inch rear tires, integrated ZT-2800 Hydro Gear transmissions, dial-adjust height-of-cut and a foot pedal lift deck for ease of use.